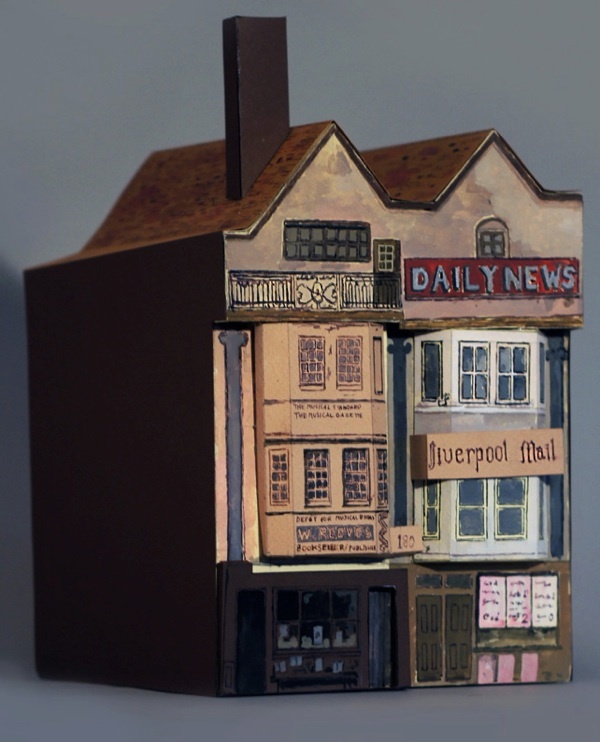 Earlier this year, Sebastian Harding made models of the lost buildings of Smithfield that had important tales to tell, but now he has cast his sights further afield with these new creations that can be seen in The Artists of Spitalfields Life exhibition until 24th November. The Saracen’s Head, 4-7 Aldgate High St. The Saracen’s Head by Henry Dixon for the Society for Photographing the Relics of Old London. Rear of the Saracen’s Head. The yard of the Saracen’s Head from the London & Middlesex Archaeological Society glass slides. The Saracen’s Head public house was demolished in 1913. Even in the late nineteenth century, Aldgate survived as a slice of sixteenth and seventeenth century London until the developers moved in from the eighteen eighties to modernize these streets. It was one of the few places to avoid the Great Fire of 1666, where the locals gathered to watch the conflagration. This makes the Saracen’s Head all the more important to the area’s history. The area of Aldgate, first documented as Ealse Gate, centred around what is now Aldgate High St – still a vital artery into the city. This road predates the Normans and the gate itself which gives Aldgate its name was originally built by the Romans. It was subsequently rebuilt in the twelfth century, the thirteenth, and finally in the early seventeenth century. Though long gone, there is a plaque at No. 88 Aldgate High St commemorating its existence. When poring through old photographs of Aldgate, I was struck by the architectural merits of the Saracen’s Head in particular. 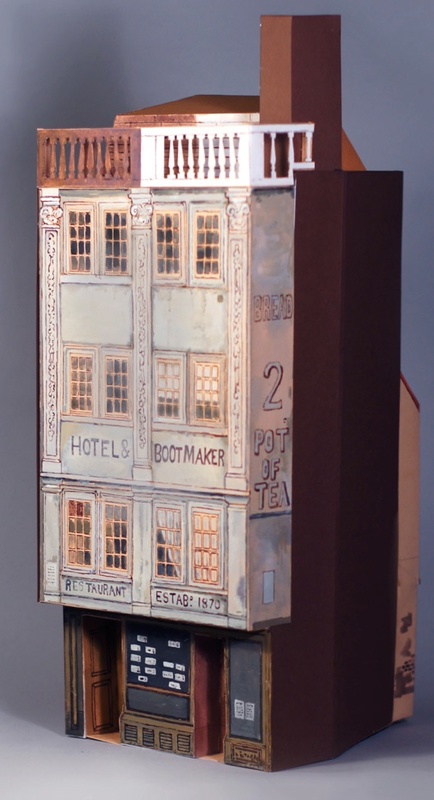 Founded in 1681, it operated as a coaching inn with a service that departed from the yard at the back, transporting Londoners to East Anglia – hence the building’s location on the main road eastward out of the city. It was documented in the nineteenth century by Henry Dixon for Society for the Photographing the Relics of Old London. These records have allowed me to recreate the exteriors viewable from the street and yard. The frontage holds wonderful early examples of Baroque decoration and the ornate moulding echoes the decoration seen on the Baroque post-Fire churches – including St Paul’s – that emerged throughout London at the time. When the building was demolished, it was functioning as the Metropole Restaurant with the Ladies Select Dining Room housed on the first floor. After its destruction, the Guildhall Museum bought the intricate wooden pilaster capitals for their collection, confirming its aesthetic importance. The Victorian buildings which replaced the Saracen’s Head and its neighbours were in turn bulldozed in the nineteen eighties to make way for the anonymous offices that dominate this once remarkable area today. Nicholas Culpeper’s House, Red Lion Field, Spitalfields. On John Horwood’s map (1794-99) Nicholas Culpeper’s house is clearly shown, sticking out on the corner of Red Lion St and Red Lion Ct. 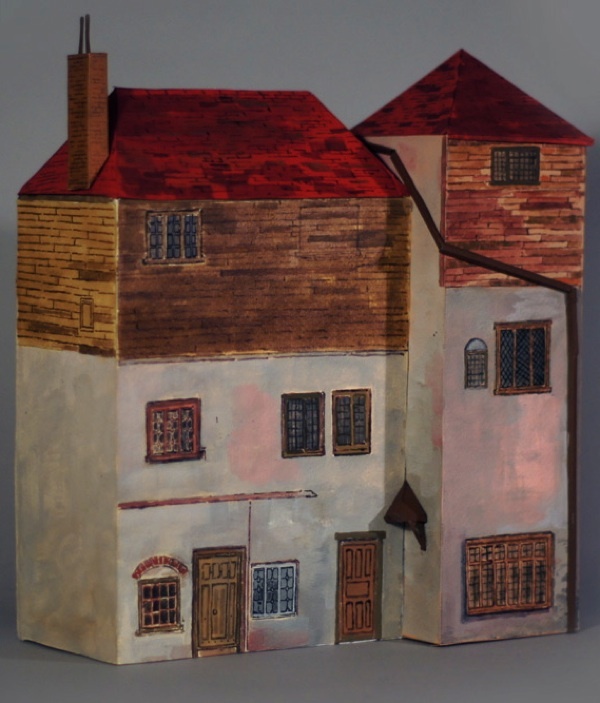 In 1640, when Nicholas Culpeper, the herbalist, married Alice Field, aged fifteen, he was able to build a substantial wooden house in Red Lion Field, Spitalfields, with her dowry. Here, he conducted his practice, treating as many as forty citizens in a morning, and in the land attached he cultivated herbs – collecting those growing wild in the fields beyond. Since Culpeper never finished his apprenticeship, he could not practise in the City of London but chose instead to offer free healthcare to the citizens of Spitalfields, much to the ire of the Royal College of Physicians. In this house, Nicholas Culpeper wrote his masterwork known as Culpeper’s Herbal which is still in print today. After Culpeper’s death, the building became the Red Lion public house, surviving into the nineteenth century when it was demolished, as part of the road widening for the creation of Commercial St to carry traffic from the London Docks. Although the site of Culpeper’s house is now in the middle of Commercial St, the replacement building which served as the Red Lion until 1917 is in use today – appropriately enough -as Spitalfields Organics, selling wholefoods and herbal products. 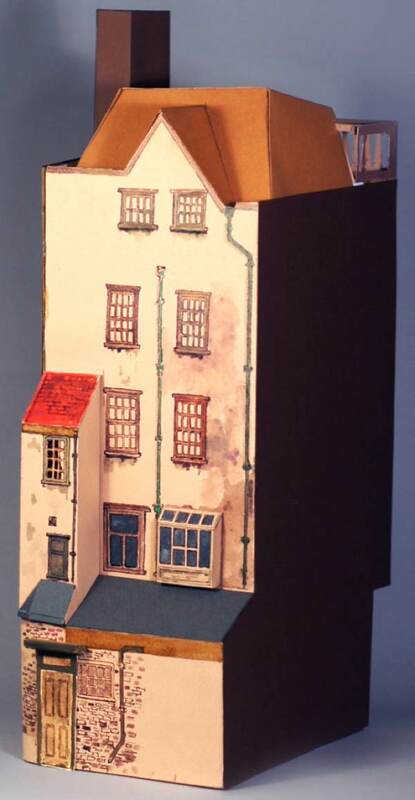 Andy Rider, Rector of Spitalfields, keeps an old print of Culpeper’s House in the Rectory in Fournier St and we are grateful to him for allowing Sebastian Harding access to this image which served as the visual reference for this model. 186 & 184 Fleet St.
186 & 184 Fleet St photographed by Henry Dixon for the Society for Photographing the Relics of Old London. If you were to take a stroll down Fleet St today, you might like to take a closer look at the buildings that stand at 186 & 184. They perch immediately to the right of St-Dunstan-in-the-West on the north side of the Street in a row of inconspicuous turn-of-the-century buildings. On closer inspection each appears distinct, but all three are somewhat tall and somewhat narrow. Their cramped proportions are explained by the fact they were built, like much of London, on the site of two ancient pre-fire buildings. The history of the nineteenth century buildings that occupy the site today relates directly to the rise of the newspaper trade that proliferated in the area. Indeed, Fleet St is still synonymous with British journalism despite all major publications now being headquartered elsewhere. Today the site of 184 & 186 is home to the Scottish firm D.C. Thomson & Co., who claim to be the last newspaper group to retain a base on Fleet St, and the titles of their publications, The Sunday Post and The Dundee Courier, are still proclaimed in mosaic on the façade of their neighbour at 188. We know how the buildings that preceded them looked thanks to a photograph taken by Henry Dixon in the eighteen eighties for the Society for Photographing Relics of Old London. Remarkably ,the buildings date from before the Great Fire of London in 1666. Thanks to the efforts of the Dean of Westminster and forty scholars roused from Westminster School in the middle of the night, the fire stopped at Fetter Lane, just short of St-Dunstan-in-the-West and these intervening houses. John Aubrey, who lived through the Fire, recorded in his Brief Lives that Michael Drayton, the great topographical poet and a contemporary of Shakespeare, once resided in the house in the middle of our group of three, ‘the bay-window house, next to the East end of St. Dunstan’s Ch. 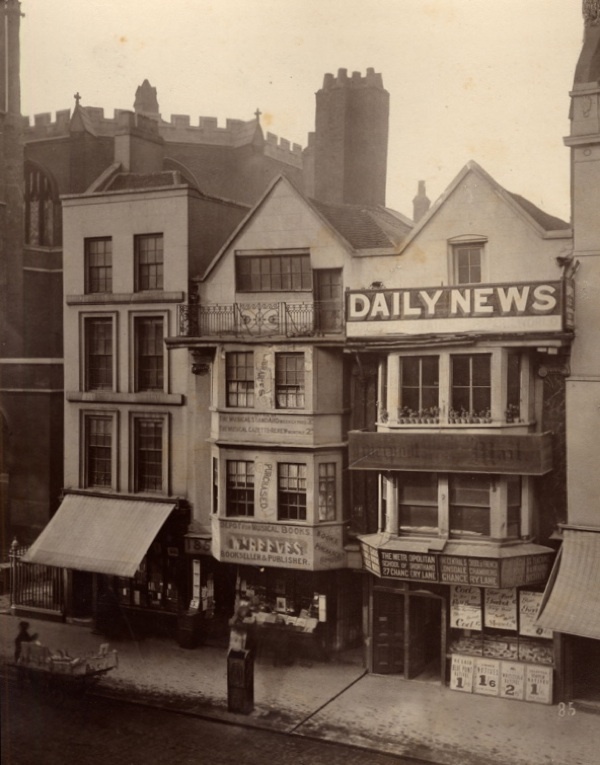 in Fleet-Street.’ Drayton is one of many significant writers who have gravitated towards the area since William Caxton’s assistant, Wynandus de Worden, set up shop nearby in 1500, thus beginning Fleet St’s enduring association with the printed word. 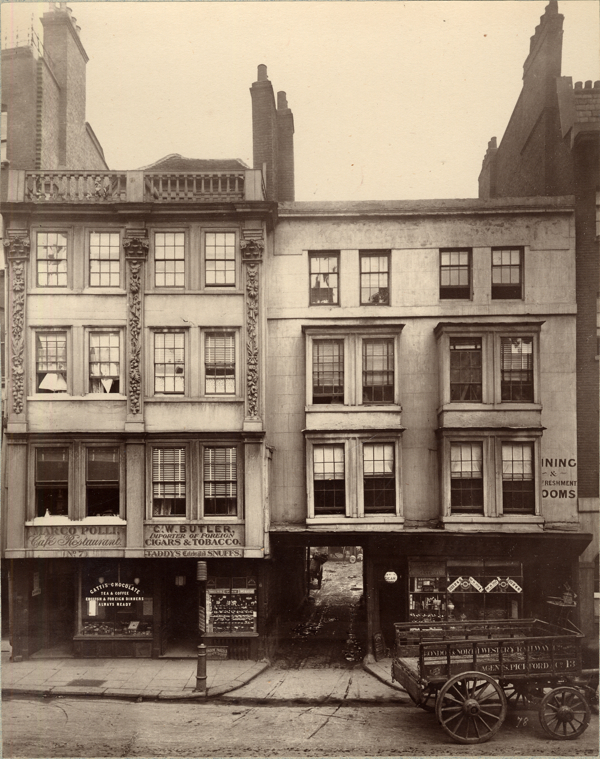 In keeping with the tradition, Drayton’s house at 185 was, at the time of Dixon’s photograph, a bookseller and publisher. The immediate area was also the setting for the story “The String of Pearls” which gave rise to the urban legend of Sweeeney Todd and his accomplice Mrs Lovett . The murderous barber in the story lived above his premises at No. 186. In the tale, he is said to have slit the throats of over one hundred and fifty customers. That a significant portion of them would have been lawyers based in the local area woud have delighted the original readership, as it still does today. Coming across Thrawl St on a sunny summer day in 2012, the atmosphere is calm and quiet. Now home to a community centre, nature reserve and basketball court, it appears to the casual pedestrian as an oasis of green and open space in a dense urban neighbourhood. This could not be more different to how it was described a mere forty years ago. Before their demolition in the seventies, the Rothschild Dwellings were visited by historian Jerry White whose first impression of the buildings was that he had “never seen tenements, so starkly repulsive” and “so much without one redeeming feature” in his whole life. The Rothschild Buildings were unveiled on the second of April 1887, less than a year before the onset of the Whitechapel murders, perpetrated in the area surrounding the Rothschild Dwellings, and illustrating very publicly the need for social improvement in this ramshackle district. Many believe the murders were a catalyst to change, but the Rothschild Buildings prove that even before that there were philanthropists and businessmen keen to support the area. The policy of cleaning up the East End had been underway in the streets around Spitalfields since the eighteen sixties. The Rothschild Dwellings were erected by the ‘Four percent Industrial Dwellings Company’ and stood on the sight of what had once been respectable middle class residences in the seventeenth and eighteenth centuries, which had degenerated into lodging houses and slums. 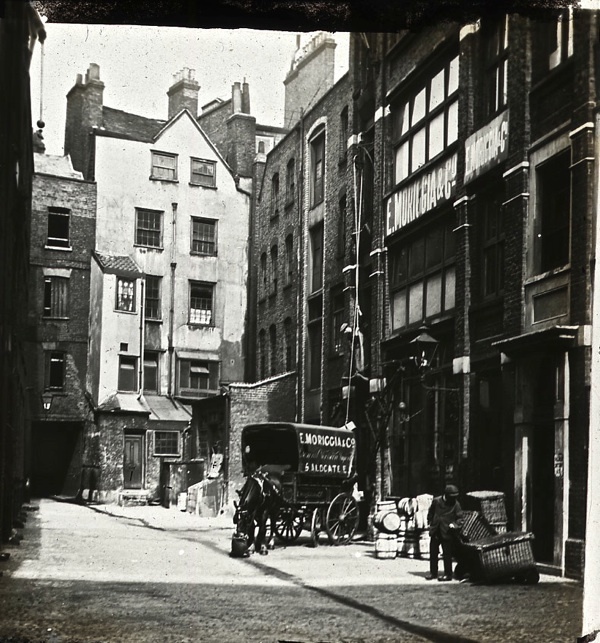 In the mid-nineteenth century, the old filthy streets with their myriad alleyways and courts were swept away. In their place, came the wide thoroughfare of Commercial St and large housing blocks such as the Nathaniel Dwellings (1892), the Lolesworth Buildings (1885) and, of course, the Charlotte De Rothschild Dwellings (1887). The tenants of these buildings were respectable working class tradesmen and craft workers able to pay the slightly higher rent. The area was heavily populated by Jewish immigrants who played a large part in instilling a sense of a prosperous community into what had been a lawless dangerous neighbourhood. There is no need to glamorize the Rothschild Dwellings for we know that they were built on basic architectural principles and given absolutely no aesthetic embellishment. These buildings were designed less as homes and more as a way to contain the working classes. Built from yellow London brick with red lintels adorning the windows, this splash of colour provided the only visual break from the mass of sulphur-toned exteriors. In terms of layout there were three wings to the building, all arranged around a large courtyard which, in the few photographs available, appear ill-lit and oppressive. But before we surmise that they were poor places to live for their inhabitants, I’d like to quote the late great Kenneth Williams when visiting the nineteenth century London council estate he grew up in - “I’m not trying to romanticize these living conditions and, of course, the rooms were cramped, but they were not jerry built and they’ve stood the test of time marvellously. On these balconies, there was a good deal of friendliness and probably a good deal more neighbourliness than you’d find on any high rise block” – Kenneth Williams, 1975. 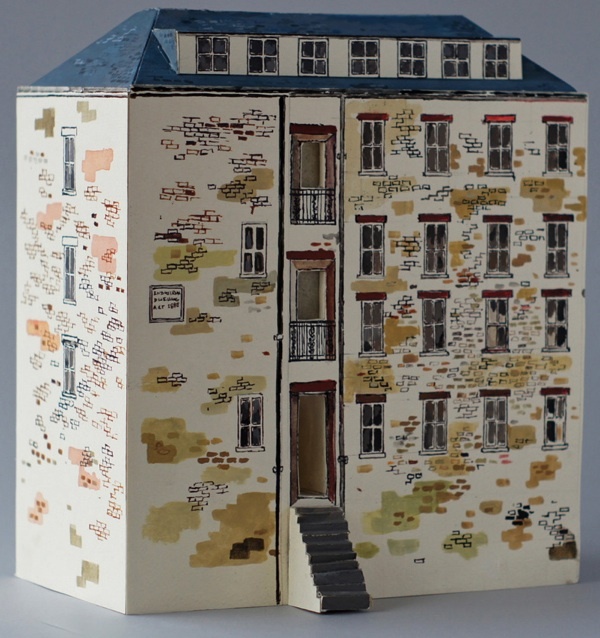 Follow Sebastian Harding’s blog The Past in Paper, publishing his models as he makes them . You can see more pictures from the Society for Photographing Relics of Old London in A Room to Let in Old Aldgate and The Ghosts of Old London. These are wonderful,I really want one. Thank you so much for posting today’s blog. It is fascinating as always but it has also helped me find a map I have been searching for. 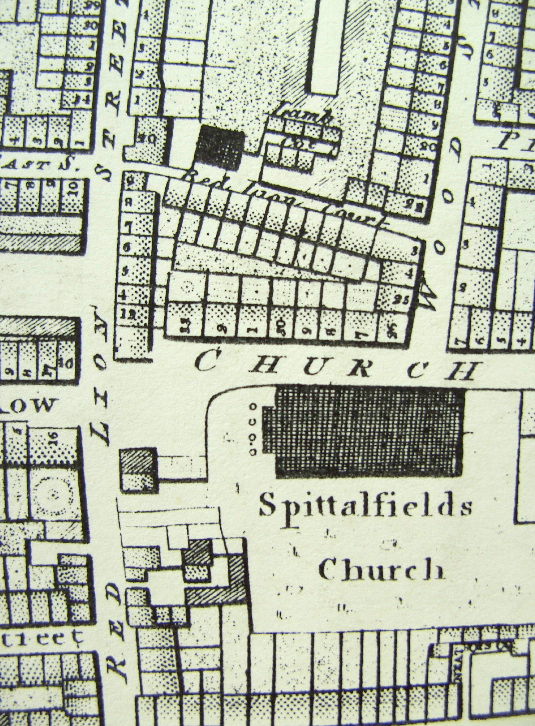 It is John Horwood’s map with the street numbers for Red Lion Street in the late 1700s. I knew I had seen it somewhere before but then it ‘cropped up’ in your blog and I was able to rediscover it. I’m now a little bit closer to the location of one of my ancestors. Thomas Mecham, who in 1827 ran a pub in Red Lion Street, Spitalfields – but it was not the Red Lion! It was the Duke of Cumberland’s Head at no.8 Red Lion Street. According to the map that location appears to be only one residence away from Culpepper’s House (which became The Red Lion). I have various sources referring to The Duke of Cumberlands’s Head in Red Lion Street from 1827 to at least 1842 by which time the road widening and street name change to Commercial Street would have been imminent! The pub has also been recorded as The Duke’s Head and The Duke of Cumberland. Although my ancestor is sited as the victim in a court case at the Old Bailey in 1827 (he mentions in the transcription of the case that he runs the pub with his daughter) Arther Christian can be found more easily as the publican in residence in 1841 and 1842.